Houzz 92 of our visitors have told a friend about this plan. Question: the window that is above the front door does it look into the foyer or is that an attic? Answer: Hello, The window is in the attic. It is above the front edge of the front porch. So its some distance in front of the foyer. Thanks. Answer: Thank you for your interest in our plan. There is another design that may have the features that you are requesting. 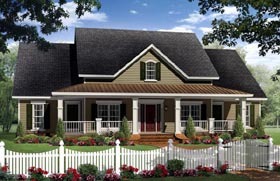 Take a look at plan 59214. The layout of this plan actually works better plus it has a bonus space above and a much larger rear porch. Hope this will help you out. Have a great day!